Preparations for the 2015 MPSGS Show are in full swing. I have finished my paintings, 1 acrylic and 2 gouaches. The acrylic beach chairs came from my February vacation down to the Florida Keys. The gouache of the old man sitting outside a small store came from my painting trip to Granada, Spain in April. The gouache of my black lab, Pepper, with my then 2 year old niece, is from an older favorite photo. As you can see, Pepper has a lot of “salt” in her fur these days but my niece still loves her like crazy. Jury for the miniature show is this coming weekend and the show will be hung in mid-November. I am hopeful all three make it into the show. In between, I will be participating in a Yellow Barn Show on October 10th and 11th and then an Olney Art Association Show starting on November 7th. 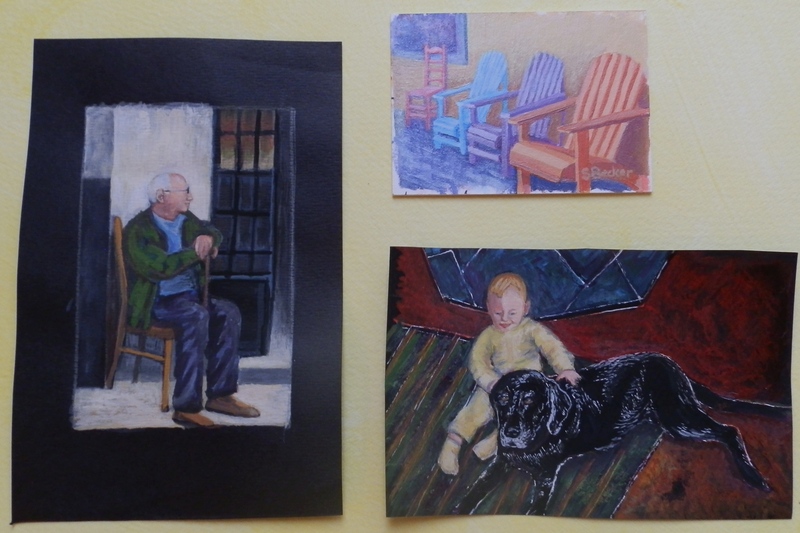 Keeping Vigil, 2 3/4 x 4 1/4; Summer Seating, 2 1/4 x 3 1/4; Pepper & Briley 3 x 4 1/2.